"The task of the kindergarten teacher is to adapt the practical activities of daily life so that they are suitable for the child's imitation through play. The activities of children in the kindergarten must be derived from life itself rather than being 'thought out' by the intellectualized culture of adults. In the kindergarten, the most important thing is to give children the opportunity to directly imitate life itself." Waldorf Kindergartens are educational environments that instill the seeds of a lifelong love for learning, helping to provide the foundation that every young child needs for self-confidence, resilience, and future academic excellence. Memory, inner picturing, sequencing, and language skills are fostered by oral storytelling of folk and fairy tales, puppetry, verses and poems. The pacing, intonation, gestures, and expression of the storyteller all support the children’s growing vocabulary, listening comprehension, and attention span as they are invited into a world of “once upon a time." Other activities nurture and challenge the children’s will: planting and digging in the garden, hiking in the local hills, kneading bread, chopping vegetables, and making crafts. Working with their hands lays a foundation for critical thinking and problem solving, and helps children develop the rewarding ability to create objects that are beautiful and functional. Craftwork also nurtures the ability to concentrate, and refine small motor coordination. 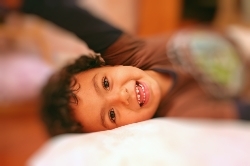 Plenty of healthy movement allows the children to grow strong in their bodies. Daily activities such as cooking, sorting, and table-setting help to establish a foundation for mathematics, sequencing, and number skills. 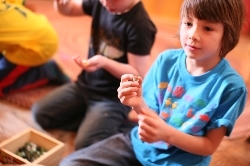 Westside Waldorf School currently houses four kindergarten classes, two at each campus, each led by a Waldorf-trained lead teacher and assistant. Kindergarten programs are five days per week, from 8:15am to 2:30pm. 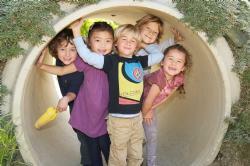 Aftercare is also available for enrolled children until 4pm at the Santa Monica campus and 4:30pm in Pacific Palisades.